Katherine Thomas is the 2019 Tanner|Hill Gallery intern. She is currently attending the NYU Stern School of Business with a full scholarship working toward a major in business with a concentration in marketing and a minor in Spanish. Katherine is from East Tennessee, where she developed her passion for reading, baking, and making people smile. Interference included a compilation of Crisp’s work spanning many years, including paintings, collage, and his book, Slave. Probably best known for his political activism, his work is often viewed through a political lens, though it can also be read as deeply personal. Crisp’s work exists in a space between directness and ambiguity. Using poetic gestures, Damien Crisp suspends direct interpretations of his artwork through emotive mark-making, and he develops new linguistic associations with repetitive text. His artwork intuitively relates to anyone living in the 21st century. Unpacking the significance of Crisp's work is a thought-provoking exercise for semioticians, painters, and psychoanalysts. Damien Crisp is an artist currently living and working in Chattanooga, TN. He received his Bachelor of Fine Arts in painting from the University of Tennessee at Knoxville and his Master of Fine Arts at the School of Visual Arts in New York City. His works in painting, writing, photography, collage, and installation. Learn More About Him Here. This show was part of a curatorial series by Ashley Hamilton. UPDATE: The Documentary has made its goal of $28,000. "We’re saluting all of you, people we know personally and those of you we’ve just met as part of the Kickstarter community," the project said, "It has taken all of you to get us through." Bill Traylor: Chasing Ghosts offers a unique perspective on a turbulent and often misunderstood century of Southern history, and on the experience of ordinary black people in extraordinary times; it also offers an inspiring lesson on the stubborn persistence of the human spirit, and the transcendent power of human creativity. Using animation, new interviews, archival photography, musical and dance performances, dramatic readings, and, most importantly, Traylor’s striking drawings and paintings, Bill Traylor: Chasing Ghosts is a 90-minute documentary designed to bring the spirit of his unforgettable work to life onscreen, and to introduce one of America’s most important and famous artists you’ve never heard of. The film prominently features Traylor’s enigmatic drawings and paintings, whose genius resides in their ability to tell their own stories. We will use them as Traylor drew them—as a way to conjure up the world that lived in his memory of a vanished rural past, and to respond to what he saw from the margins of an early 20th century Southern city. Willie Young view an installation of Thornton Dial's The Reservoir (1990) with Weatherspoon Museum Director Nancy Doll last summer. Artwork by Willie Young will be featured at the Baker Museum in Naples Florida. The museum hosts the third installation of Inside the Outside: Five Self-Taught Artists from the William Louis-Dreyfus Foundation from March 28 through July 23. Praise for the show by independent scholar Tom Patterson noted that Willie Young stands out from Thornton Dial, Nellie Mae Roe, Bill Traylor and James Castle through his "highly refined and... impressive command of shading and modeling". Co-Curated by the Katonah Museum of Art, the exhibit was most recently on view at the Weatherspoon Art Museum in Greensboro, North Carolina Carolina. Tanner|Hill Gallery will show a private collection of drawings that date between 1890 and 1900 at the Outsider Art Fair - New York January 19-22 2017. The works on paper possess a distinctive dialect of colloquially informed written passages that were created by an artist working just before the beginning of the 20th century. Locations mentioned in the drawings range from the rural midwest of the United States to the urban areas of southern states; and, they depict activities related to farm life, clothing and fashion, and historic battles from the Civil War. These homespun, iconoclastic vignettes of life and human foibles and animal habits, in general, are highly personal, creative drawings that are very distinctive versus the highly Victorian drawings that were popular at the time. Tanner | Hill Gallery will debut a rare collection of work from Reverend Howard Finster. The body of work documents the early visions of Reverend Finster through notecards on his sermons, and includes excerpts of religious texts, drawings of the Reverend’s visions and archival notes on the Baptist preacher's daily life in Georgia. Artifacts from the cards’ time period will be on view for visitors to the art fair. Many of the "thought cards" offered coincide with Reverend Finster’s debut at the Phyllis Kind Gallery, and date from 1976-1982. Previously Reverend Finster's sermon cards were shown at The New Museum in an exhibition called "Revelations" . The Thought Cards offered by Tanner | Hill Gallery are central to Reverend Finster’s early formulation of his paintings. Many of the Thought Cards lyrically describe visions of worlds beyond the light of the sun and were featured alongside the Baptist Preacher in a June 1980 article in LIFE Magazine. Tanner | Hill Gallery is pleased to present the work of Willie Young at Paris OAF 2016. This will be the first time Young’s work will be shown outside of the United States. Willie Young was born in 1942 and has lived and worked in and near Dallas, TX his entire life. He is, broadly categorized, a self-taught artist. With the exception of the drawing classes he attended with Chapman Kelley’s in the 1960’s Young’s practice has developed independently, and in large part amid the quiet bustle of the barbershop where he worked shining shoes for the past several decades. The “self-taught” designation is of course irrelevant to the viewing of actual artworks, and in Young’s case the term seems particularly anomalous as applied to drawings that powerfully contradict unspoken assumptions of works made outside the mainstream. Where qualities of blunt and uncensored expression might be expected, Young’s drawings are unvaryingly fine-handed: they are suggestive instead of forthright, muted instead of overt. They bring to mind a creative state of sustained and patient invention - in which cryptic forms unfurl through a deliberate cross hatch. Young’s restrained palette is limited to the dull sheen of graphite from a 2B pencil, occasional touches of white chalk, and the ground of his paper that rarely strays far in tone from the found-kraft wrapping he began using in the 1970’s. Commonplace things - roots, acorns, cracked sidewalks - often serve as starting points for Young’s works. Revisited in countless variation through series of drawings, these initial forms take on new and unknown identities; extending and receding in untethered space, they hint at a sense of subtle freedom and mysterious purpose within the stark confines of the paper’s edge. His untitled pieces feature enigmatic objects — unrecognizable, but executed as carefully as medical illustrations — suspended in negative space, and all of them share a certain sort of clinical, sci-fi aspect. One drawing, of a segmented, horn-shaped form, might be a piece of armor worn by a futuristic warrior; another long-stemmed, geometric structure might be a space station on a distant planet. Still other shapes, bearing long articulated tendrils, suggest protozoan life-forms seen under a microscope. Aside from his finely honed drawing skills, Young’s work is distinctive for what it doesn’t show. In each case he gives what look like a carefully rendered segment of something that mostly goes unseen, as if it’s been erased or shrouded in impossibly dense fog identical in color to the brown wrapping paper on which Young apparently prefers drawing. Young’s work has been represented by Tanner|Hill Gallery since 2006 and featured in solo exhibitions at numerous art fairs across the United States. His drawings were included in Prospect New Orleans 2015, and were recently on view at the Katonah Museum of Art and the Weatherspoon Art Museum as part of the exhibition “Outside the Inside: Five Self-Taught Artists from The William Louis Dreyfus Foundation.” Young has been nominated this year for a Joan Mitchell Foundation 2016 Emerging Artist Grant. New York Times, NY Region, August 13, 2015. Winston-Salem Journal, July 10, 2016. Willie Young’s work is currently on view at the Weatherspoon Art Museum in North Carolina, featured in “Inside the Outside: Five Self-Taught Artists from the William Louis-Dreyfus Foundation.” The exhibition includes Young’s drawings alongside the work of self-taught greats - James Castle, Thornton Dial, Nellie Mae Rowe and Bill Traylor. Organized by both the Katonah Museum of Art and Weatherspoon Art Museum, this traveling exhibition will head to the Baker Museum of Art in Naples, FL. next year. “Inside the Outside” was reviewed in both the New York Times and The Greensboro News and Record. Willie Young at Griffin Barber Stylist in Farmer’s Branch, Texas. For the past two Outsider Art Fairs we have had solo shows for two different artists: Stephanie Wilde of Boise, Idaho and T.A. Hay of Kentucky. In this year’s fair, we will host a solo exhibition by Dallas based artist, Willie Young. Although Young ‘scribbled’ most of his early life, as he says, the majority of his graphite drawings have been executed in-between shoe shines at various barbershops around Dallas since the mid-60s. Freely drawn, untitled pieces on solid fields of found brown paper make up his earliest body of work. Young’s pieces expand from atmospheric, organic drawings seemingly untethered by gravity to nonspecific but heavily grounded surreal ‘landscapes’. Narrative is so unimportant to Young that he has never titled any piece. 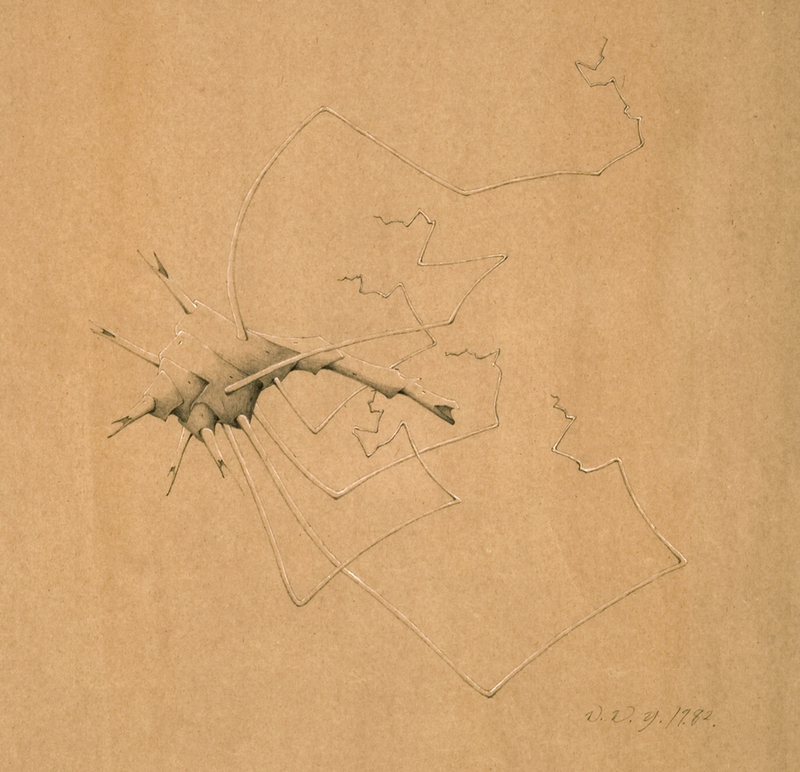 Although narrative elements are extraneous to Young’s drawings, and his works are thematically unrecognizable, Young has said his work is inspired by observing ‘small life details’ - from a crack in the concrete, to the bones of small animals he has found and kept for inspiration, or dust particles floating in a framed window. Most recently Young’s work was included in the Katonah Museum of Art exhibition Inside the Outside: Five Self-Taught Artists from the William Louis-Dreyfus Foundation. The exhibition travels to the Weatherspoon Museum of Art opening in May 2016. The Outsider Art Fair has been a wonderful show this year, with the new venue of the Metropolitan Pavilion serving artists, exhibitors and visitors well. Winter Storm Jonas has given us all some challenges, but we're open and enjoying the intimate feeling lent to the day by the inclement weather outside. There have been many favorites, pictured here are Stephanie Wilde's work at Stewart Gallery, and Thornton Dial's "Smooth-Going Cats Going to the Top", 1988, at Fred Giampietro. As an artist, this is simply her time. Stephanie Wilde’s work is among that of a small group of uncommon artists I have had the pleasure of discovering. One of the imperatives to the understanding Wilde’s work is the essentialness of the narrative. If heard and understood, Wilde is one of the humble voices speaking truth via strikingly beautiful imagery. In my twenty-five years searching for talent in unusual places, I found this quiet yet profound voice in the Snake River Plain of Boise, Idaho. In December 2015, the Joan Mitchell Foundation of New York announced that Stephanie Wilde is one of the 2015 Painters/Sculptors Grant Recipients. In addition, Wilde has been accepted as a residence artist in 2017at the Djerassi Resident Artists Program outside of San Francisco, California. Hopefully, these recent awards are further indication that maybe, just maybe, the art world will slow down to appreciate truly mindful work beautifully executed.